Earn the benefits of being recognized as a sector leader and advance your organization's mission through networking and marketing opportunities. 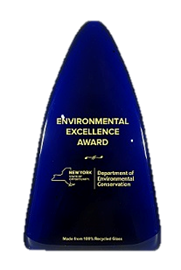 Those interested in applying are encouraged to attend the webinar "Apply for a NYS Environmental Excellence Award & Get Statewide Recognition" on Wednesday February 24, 2016, 10:00AM-11:30AM. Registration is required. Participants will learn about the benefits of being a NYS Environmental Excellence Award winner; get tips for submitting a competitive application and hear from previous award winners (Golub Corporation/Price Chopper & the National Hockey League). creative urban forestry or farming practices, including programs to advance "farm to table." Additional information is available in DEC's press release.